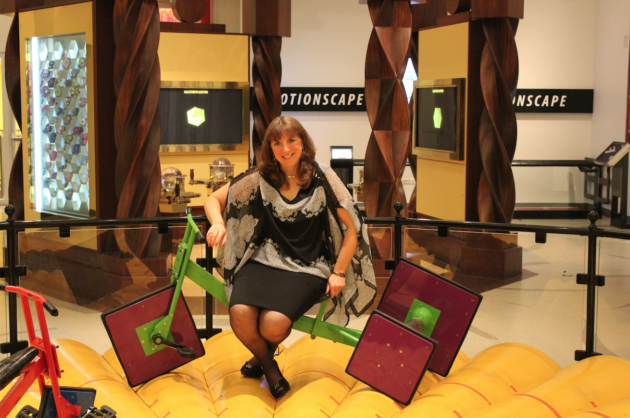 “MoMath wants to be the symphony of mathematics,” says Cindy Lawrence, founder and executive director of the National Museum of Mathematics, North America’s only mathematics museum. Lawrence notes that a child can hear a symphony and become inspired to be a musician, and that before this museum came into being, there was no way to generate this kind of enthusiasm about mathematics. Now, Lawrence tells stories of parents dragging crying children out of the museum because they don’t want to leave. Often, these same children didn’t want to go to a math museum in the first place. Lawrence became involved with MoMath after meeting Glen Whitney, a fellow founder of the museum, at her temple. “It was Glen’s idea to create a museum of math, and were it not for my initially getting to know him during Tot Shabbat, I would never have been a part of this exciting venture,” she said. “I am delighted that my Jewish connection and heritage paved the way for me to join this exciting project,” she said, adding that “my background and Jewish heritage and values have always been an important part of my life.” She considers her work with MoMath to be a part of tikkun olam, repairing the world. Lawrence is very aware of the gender gap that exists in STEM fields (science, technology, engineering and mathematics) and has made it part of MoMath’s fiber to work towards addressing these inequities. “We need to have more role models and display more role models,” she says. Additionally, Lawrence has investigated ways to make exhibits more inclusive to girls, such as making clear the social value and the impact of the math being described. Lawrence also tries to ensure that none of the exhibits seem like they’re targeted only towards boys. For instance, one display was originally focused on railroads. Given that this is often gendered as male, Lawrence changed the display to have beavers in a forest. She notes with satisfaction that children of all genders happily interact with the exhibit. In addition to having gender equality incorporated into the daily running of the museum, Lawrence is currently raising funds to continue programming based on a “phenomenally successful” event for teen and tween girls at which five female mathematicians and physicists spoke. A parent of a son and two daughters, Lawrence says gender inclusivity at MoMath is something she is committed to both professionally and personally.